Through his solemn gestures, impenetrable gaze and distinctive and elegant dress code, Karl Lagerfeld left his mark on fashion as well as popular culture. He was such an enduring presence that we believed him to be immortal - but he is no more, having left us in February 2019 at age 85. What a paradox for a man whose calling in life led him to work around the clock in the fleeting world that we call fashion. The luxury and fashion sectors are in shock, as a true giant has left us. Here, we examine his legacy. Karl Lagerfeld was proud of his German heritage and kept his accent. Yet at the same time, he was a man of the world in all senses – curious, cultured, fluent in four languages and open to outside influences and trends. And this despite one of the key principles of luxury being the label “made in”. While the nationality of “fast fashion” brands is of little importance (it matters little that Zara is Spanish or H&M Swedish), for a luxury brand, cultural roots are absolutely fundamental. Chanel is the epitome of France. And yet, the man who saved Chanel back in 1983 was German. During the Renaissance, Leonardo da Vinci placed himself at the service of the King of France, and when French fashion was at its peak, Karl restored Chanel’s image as an iconic French brand. Many comparisons have been made between the lives and careers of Karl Lagerfeld and Yves Saint Laurent. They were great rivals, in both their public and private lives. While Lagerfeld never invented a style in the way that Christian Dior, Cristobal Balenciaga, Yves Saint Laurent and Coco Chanel herself did, the Chanel brand never enjoyed as much success while Coco was alive as it did during Lagerfeld’s reign. Karl Lagerfeld’s great talent was to bring new life, dynamism and inspiration to major fashion houses terrified of betraying the heritage of their creators. Had it not been for Lagerfeld, where would Chanel be today? As its chief designer, it was he who brought Chanel renewed success, without which it may well have fallen into obscurity and would certainly never have become the symbol of fashion and chic à la française that it is today. How did he achieve this miraculous feat? Here lies the second lesson: by upsetting and shaking up the status quo. In effect, if too much respect is given to major fashion houses and their heritage, they become mummified, entombed, immobilised. It was this man, irreverent yet respectful, who was willing to – as he himself put it – “turn Coco Chanel in her grave"… in order to keep her name alive and highly relevant. Lagerfeld inspired other gifted designers to dust the cobwebs from their institutions and transform them into the watchwords of class and elegance, such as John Galliano at Dior or, more recently, Michele Alessandro at Gucci. 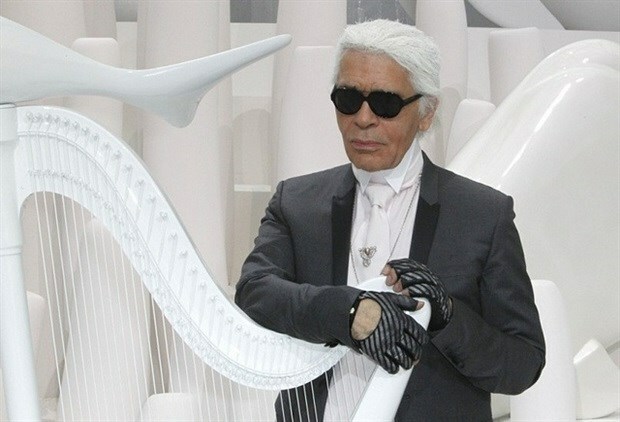 Another major legacy of Karl Lagerfeld is that he understood that today’s luxury brands need to leave their mark well beyond their specialist areas (in Chanel’s case, clothing, accessories, perfume and jewellery). To achieve this, they must maintain close links with those in cultural, artistic, musical and photographic circles – photography, in particular, having an increasing cultural impact on social network sites, from WeChat to Instagram – and with the crowds clamouring for beauty in a world that is strikingly less beautiful. Lagerfeld was one of the first designers to produce branded content for millennials hungry for surprise and creativity, expanding Chanel beyond the designs that he had conceived in his own exacting way. He broke down the barriers separating fashion and luxury, using a degree of theatrical flair in creating his own public persona. This led some to liken him to Andy Warhol, whom he met in 1970. For all that, the Kaiser never referred to himself as an "artist”. This wasn’t out of modesty, but rather pragmatism. At a time when many designers sought to be seen as artists to increase their sense of importance, raise their profile and escape the tag of “designer”, Lagerfeld would usually respond – in the rather scathing way for which he was renowned – that they were there to sell handbags and that their contracts would be torn up if sales failed to satisfy the shareholders. For him, things were very clear: luxury is first and foremost a business. This leads us to his final legacy: Karl Lagerfeld left the matter of the best governance to adopt for a luxury fashion house completely open. Under his stewardship, Chanel earned more money than it ever did before. Thus an independent, “family-owned” fashion house, which is not accountable to the stock exchange and therefore has time on its side, has emerged as the best path forward when it comes to high-end luxury. This path was much more profitable in every sense than those of large consolidated groups. Karl Lagerfeld often said that he didn’t do marketing, that he had never attended a business meeting, that he let his creative instincts speak for him. Of course, those words need to be taken with a pinch of salt, as they were made to maintain the myth of luxury. But they also provide a lesson in leadership that the Wertheimer brothers, the owners of Chanel, understood.